2 - 4..............Bingo von Ellendonk. 3 - 4..............Satan von Ellendonk. 3 - 4..............Blanka von der Au. 4 - 5..............Gero von Ellendonk. 4 - 5..............Afra von Hohenstaufen. 4 - 5..............Ralf von Forell. 4 - 5..............Asta von Fischweiher. 1997: 96-83-92	= 271 points (7th). 1992: 82-90-91	= 263 points (13th). 1996: 99-95-98 = 292 points (2nd). 1994: protection score of 98 points. 1991: 97-92-97 = 286 points (2nd). 1996: 100-94-94 = 288 points (1st). 1993: 100-91-97 = 288 points (1st). 1992: 100-96-92 = 288 points (1st). 01/09/1991: 96-91-94 = 281 points (3rd). 23/11/1996: 100-95-94 = 289	points. 19/08/1995: 97-93-80	= 270 points. 02/09/1995: 100-95-81	=	276	points. 01/12/1991: 93-99-99 = 291 points (3rd). Overall Build: Medium-strong constitution; barely pronounced gender type; short dense fur; good colour, well-defined markings; normal developed testicles; correct forehead; parallel head planes; shallow stop; full scissor bite; eyes appropriately set, medium-sized, oval and medium brown; correctly styled and cropped ears; strong and appropriately built neck; short and firm back; slightly sloping croup; very good chest depth; very good chest width; good rib curvature; good fore-chest; sufficiently raised underline; good front and rear angulation; sufficient upper arm length; shoulder blade angle; good elbows; correct pasterns; good stance; short closed front paws; sufficiently powerful bone; well positioned thighs; outward twisting knees; rear feet set outward; medium-strong hocks; somewhat long and slightly spread rear paws. Evenly-matched gaiting; sufficient front gait; sufficient rear push, good firmness in back, ligaments and joints. Nature: Spirited; naturally calm, free and friendly in the group; open and sure with sound exposure, unconcerned with gunshot; middle sharpness, very high protective instinct, fighting spirit, courage and hardness. Gero von der Mooreiche competed four times in the D.V. Meisterschaft and was runner-up on two of those occasions, once in 1991 with 286 points and again in 1996 with 292 points. He was the Landesmeister of Landesgruppe Westfalen in 1992, 1993 and 1996 (each time with a score of 288 points) and placed seventh in the working I.D.C. Weltmeisterschaft in 1997 with 271 points. He also passed the Körung 'for life', both times with highest possible rating for hardness and working drives (very high for protection, courage, hardness and fighting drive with middle sharpness). Gero was well-known for his extremely fast and hard hitting courage tests which earned him the name “King Tiger” from Germany's finest helpers. Gero's dam, Cora von der Mooreiche, and her littermates, Castor and Chiela, competed in the D.V. Meisterschaft and also passed the Körung 'for life' with ratings ranging from high to very high with middle sharpness. Castor von der Mooreiche was also show champion. Gero's sire, Asko von der Weyermühle, is from the legendary von der Weyermühle “A” litter, many of whom competed in the D.V. Meisterschaft and passed the Körung with highest rating for hardness and working drives. Gero lived to 12 years of age while his dam, Cora von der Mooreiche, lived to 11 years of age, his paternal grand-dam, Cona von Niederkassel, lived to 14½ years of age and his maternal grand-sire, Ali von Langenhorst, lived to 16 years of age. The combination that produced Gero was also repeated (Amor von der Weyermühle x Cheska von der Mooreiche) by the vom Merkureck kennel for their “A” litter. This litter is very well-known in the working circles with Andy and Anouk both competing in the D.V. Meisterschaft and Adux being a well-known police dog in Germany. Cuba: IPO 3 and passed the Körung with Körklasse 2A rating. She is dam of the vom Eschenbruch “H, K, O” litters (Kuba, Onehundred). Faro: Polizeidiensthund, SchH 3 and WPO (winner of Police Dog Championship). He is sire of the van de Berkensingel “U, V” litters. Mascha: SchH 3 and dam of the von der Mooreiche “G, H, J, L” litters (Bingo, Bessi, Frisco). Illex: SchH 3, FH, DV-DM participant, LG-Landesmeister and passed the Körung 'for life' with Körklasse 2B for character. He is sire of the vom Kloster-Kamp “O, Q” litters and vom Krähenbusch “H, J, K, L, M, P” litters. 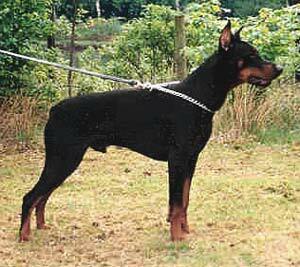 Arabella: SchH 2 and dam of the “F, J, K” litters (Katharina). Normen: SchH 3, FH and sire of the vom Schwarzen Engel “A” litter (Arak) and von der Wudritz	“C, D” litters (Citto). Nicki: SchH 3, DV-DM participant.